From June 29th to July 28th Barolo will host the next edition of Collisioni, the “agrirock” festival of literature and music taking place since ten years in the amazing Langhe’s landscape, one of Unesco’s World Heritage sites. For a month, the italian wines’ Mecca will host will host music concerts, meetings, conversations with Nobel prizes for literature, italian and international music stars, world famous film directors, for this big festival that attracted over 110 thousand Italian and foreign visitors in its 2017 edition. Collisioni is food&wine culture also, with “Progetto Vino”, created and directed by the writer and wine expert Ian D'Agata with the aim to promote italian wine variety and richness. The project has become a point of reference for the whole international wine community, hosting every year tastings reserved to over 70 wine professionals: journalists from the main international magazines, buyers, starred sommeliers, experts, all personally invited by mr. D’Agata because of their international and commercial influence on reference markets. Experts will take part to a rich program, including private tastings, focus groups on international markets, debates, compared tastings, wineries tours, walk-around tastings, lunches and dinners with producers and associations. 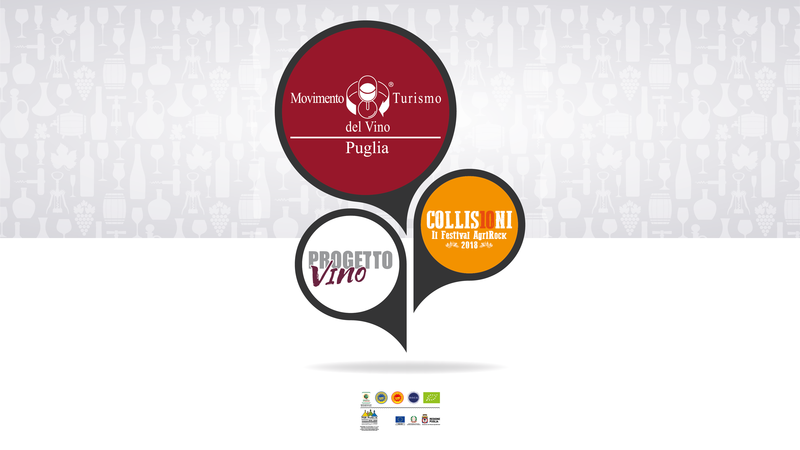 This initiative is included in the wider project named “I vini di Puglia nelle fiere internazionali del vino”, presented by Consorzio Movimento Turismo del Vino Puglia to be funded by Regione Puglia – Dipartimento Agricoltura, Sviluppo Rurale e Ambientale via PSR Puglia 2014-2020 – Sottomisura 3.2 “Sostegno per attività di informazione e promozione, svolte da associazioni di produttori nel mercato interno”. Barolo Castle houses the exclusive Pugliese dinner. The best labels of the participating wineries will be combined with the dishes created for the occasion by Alessio di Micco, executive chef of the Ristorante Corteinfiore di Trani.